Ticket includes admission to The Fabric of India. 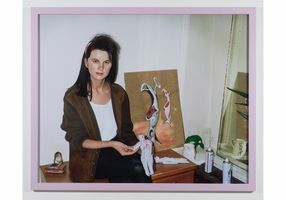 The Cincinnati Art Museum presents a major exhibition featuring the British conceptual artist Gillian Wearing, whose work is regarded as being among the most significant artistic statements of our time. Since her emergence in the London art scene of the 1990s, Wearing has taken as her subject nothing less than the experience of being human. Her photographs and videos illuminate unspoken dimensions of our most common relationships and acts, shedding light on the ways we inhabit personae and expose or conceal interior thoughts and desires. Life: Gillian Wearing includes a concise selection of the artist’s iconic lens-based works along with several new projects receiving their world premiere in Cincinnati. Wearing, who won the Turner Prize in 1997 and was appointed O.B.E. in 2011 for services to art, is best known for documenting strangers’ thoughts and confessions through film and photography, as well as re-presenting herself as other artists or family members through the use of masks and elaborate staging. The video installations and still photographs on view at the Museum chart new territory in the artist’s engagement with identity, self-revelation and contemporary media culture, exploring tensions between public and private life, the drive to tell our own secrets and know the secrets of others, and the blurry line between documentation and a constructed point of view.